Healthy in-cabin space despite the compact proportions. Peppy petrol and frugal diesel engines. Safety features such as ABS (Anti Lock Braking System) and Airbags available as an option across the range. Optional AMT across variants. Easy to drive in the congested city. Jerky shifts on the AMT. Not as smooth as a conventional automatic. Both engine options best suited to the city; feels underpowered on the highway. Build quality could have been better; doors shut with a clang - feel slightly flimsy. Refinement and NVH levels. Tthe 2-cylinder diesel motor sounds coarse and a lot of noise filters inside the cabin. The Celerio is a neutral car, that won’t offend you nor please. It will go about its work in a manner that will ensure peace of mind. Couple that with Maruti’s fantastic service support network, and you have a near perfect ownership experience. "The Celerio is a neutral car, that won’t offend you nor please." Yes, it does have few issues like the inconsistent quality, lethargic diesel engine and doesn’t have all the features that some of its competition boast of. But, as a city commuter, the Celerio - especially in its petrol powered avatar will not disappoint. The styling on the Celerio follows a design theme that Maruti calls ‘CICO’ (Curve in, Curve out). Design elements are majorly subdued and conservative, and in no way are groundbreaking. In spite of the Grand i10 being a full 40mm longer than the Maruti, the Celerio has the exact same wheelbase. The way Maruti has packaged the car needs special mention. Wheels are pushed all the way out to the extremes, liberating more space for the passenger cell. The hatchback gets plenty of curves and creases that complement its compact proportions really well. The large chrome grille flows into the droopy headlamps. The subtle creases on the bonnet and the front bumper lend it a bit of aggression. The silhouette is typically Maruti, featuring just a dominant character line running along the length of the car and flowing into the wrap around tail lamps. The blacked out B-pillars, indicators on the ORVM and the 14-inch wheels all do their bit in adding a dab of premiumness to the hatch. The rear is clean and simple, with the exhaust tucked away neatly under the bumper. The almond-shaped tail lamps remind us of the Alto 800 at first glance. The top-spec trim gets a rear defogger and rear wash wipe as well. The boot space is a healthy 235-litres, which, although less than the Grand i10’s 256-litre boot, is significantly bigger than the Chevrolet Beat’s 170-litre storage space. The rear seat gets a 60:40 split for additional luggage, and can be folded away all together to liberate 510-litres of space. Step inside the cabin and a familiar Maruti layout welcomes you. The dual tone beige and black combination is pleasant and dull silver accents strewn across the centre console look nice and classy. The build quality of interiors has definitely gone up compared to older Marutis. However, compared to its immediate rivals such as the Tiago or the Grand i10, the quality does seem a notch lower. We believe the Celerio scores very high in terms of ergonomics; everything falls to hand very easily and is in just the right spot. The steering wheel is borrowed from the Swift. It gets controls for the audio and calls, the buttons for which feel tactile. The wheel itself has a grainy texture, it isn’t wrapped in artificial leather like the Grand i10. The cluster is a three pod unit that houses a tachometer, a speedometer and a multi-function display that lets you toggle through data like average fuel economy, distance to empty and instantaneous average as well. The rear bench sits slightly higher than the front seats and is reclined backwards at a comfortable angle. The seats are rather thin, owing to which support and cushioning is average at best. The bench will accommodate two people in relative comfort. However, a third passenger at the rear will be a tight squeeze. Unlike the Grand i10, the Celerio misses out on rear AC vents, but it isn’t a deal breaker in any way. The world’s smallest diesel motor found its way into the Celerio’s engine bay in 2015. Dubbed the ‘DDiS125’, the 793cc motor comprises of just two cylinders. The overall power output does look meek, especially when stacked against its closest rivals. The two-cylinder motor comes to life with a shake and stir, and vibrates quite a bit before settling into a somewhat smooth idle. On the move, it does sound coarse and the engine noise will filter into the cabin at lower speeds. As the revs climb, the clatter becomes all the more nagging. The motor lacks the outright punch you’d require for overtakes on the highway. That said, it is decently peppy for driving around in the city. All said and done, it is still the claimed 27.62kmpl mileage figure that tilts the decision in the Celerio’s favour. Compared to its rivals, the Celerio diesel has the least amount of power and torque. However, the lower kerb weight makes the little Maruti light on its feet. The petrol option on the Celerio features a slightly altered K10B motor that also does duty under the bonnet of the WagonR. This 3-cylinder, 998cc engine comes mated to either a 5-speed manual or an automated manual transmission (AMT). The light clutch and the rev-happy motor is an amazing combo for city commutes. The power delivery is linear and there is enough low-end grunt to pull cleanly in one gear higher. However, the engine does get very vocal at high revs where the power tapers off very quickly. Irrespective of transmission option, the engine manages a claimed mileage of 23.1kmpl. The same engine powers the CNG variants as well, but the power output drops to 59PS@6000rpm and so does the torque with 78Nm@3500rpm. However, this helps in returning a staggering mileage of 31.79kmpl. Notably, the CNG variant is available with the manual transmission only. The Celerio is equipped with an automated manual transmission. There are just two pedals, and the operation is like a conventional automatic vehicle. Slot the gear lever in ‘Drive’ (D), let go of the brakes and the car creeps forward. The operation of the clutch, is controlled by a hydraulic actuator - thereby relieving your left leg. The AMT on the litte Maruti isn’t the most polished units around; there are slight jerks when the car upshifts or downshifts. That said, they can be easily overlooked during daily commutes. You can also take charge of the gears yourself by shifting it into manual (M) mode. You shouldn’t be cornering hard in the Celerio, but if you insist on doing it, it does fairly well. There is a hint of unavoidable body roll owing to its height, but other than that - it does feel composed. High speed stability is confidence inspiring upto 120km/h, post which the car will feel twitchy. Stopping power comes from a pair of ventilated disc brakes in the front and drum brakes at the back. Braking is standard fart - the car comes to a halt cleanly in a straight line without squiggling about too much. 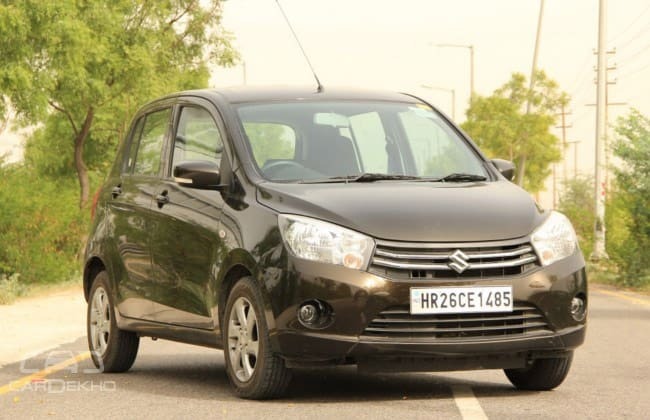 Recently, Maruti has offered optional ABS and Airbags across all trims, which is appreciable. This is on par with what the segment offers. In the EURO NCAP tests, the top end version of Celerio scored 3 stars out of 5. The base L trim is best avoided, since it misses out on important features like audio system, keyless entry, and power windows. However, this variant has some of the essentials like power assisted steering along with manual air conditioner and heater. If you are on an absolute budget, pick the L(O) variant, the ABS and airbags are definitely worth the premium. The mid-spec V trim gets goodies like power windows and central locking system for five doors. It also comes with a 60:40 split folding rear seat, rear luggage shelf, and passenger side sun visor. The top-spec Z trims gets an integrated music system that supports radio, CD player, AUX-In, Bluetooth and USB connectivity. It also gets a tilt adjustable steering with mounted controls, a rear wash wipe and defogger as well. The Z or the Z(O) trim are the only ones that can be termed as a complete package.